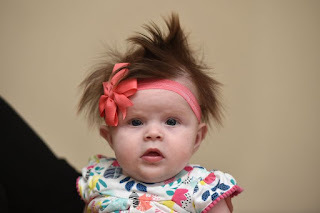 This adorable baby was born with an incredible shock of black hair that is so thick it showed up on ultrasounds. Jolee Shead is one of Britain's hairiest babies at just three months old. Thanks to the scans her parents knew she would have a glorious head of hair, but they were still amazed when she was born with her luscious locks. Mum Laura told the Liverpool Echo that people stop her in the street to marvel at her daughter's thick mop of hair. » I am long, thick, smooth,sweet,straight and sometimescurvy.....what am I??? ?